Not many companies end up highlighted on The Ellen Show, but that’s exactly what happened for Capital One, and it can all be credited back to the company’s customer-centric culture. After her fiancé broke up with her and she moved out, a Capital One customer’s card was flagged for fraud when she ordered furniture sent to her new address. The customer called and explained the situation to contact center employee Tonya, who gave her 4,500 miles for a vacation after her rough breakup and even sent her flowers. The story went viral, but according to Doug Woodard, SVP Customer Operations at Capital One, things like that happen regularly. At Capital One, a customer-centric culture starts with trust. Executives work to create an environment where they can trust employees, which gives employees freedom to help customers in whatever way best meets their needs. All employees are encouraged to look for ways to build a connection with customers. Doug considers it his job to care for those people who care for the customers. He aims to support the customer-facing associates and empower them to serve customers. Capital One is so successful with its culture because it starts at the top. From the C-level down to entry level employees, customers are an integral part of the DNA of the company. A customer-centered culture means that customer experience doesn’t just fall on one department—it is the responsibility of everyone in the organization. Everyone has a responsibility to understand customer feedback and make improvements to customer experiences. 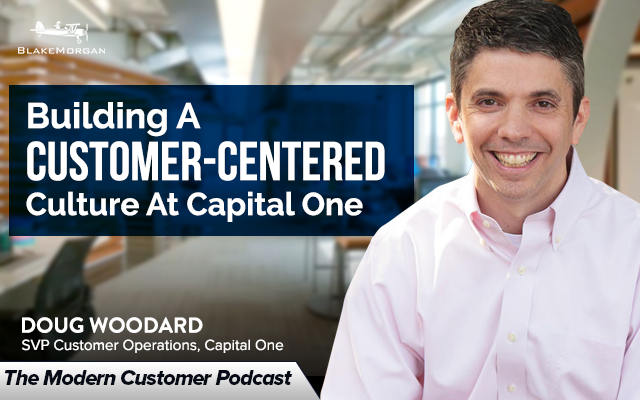 At Capital One, that happens as leaders invest time in getting closer to customers by going to the call center, reading customer feedback, and sharing that information with their employees, no matter what department they are in. Employees are recognized publicly when they are a hero to customers, which reinforces the customer-first culture. According to Doug, a customer-centric culture is also built on transparency. Companies have to mean what they say and say what they mean. Culture is transparent to customers, and they can quickly see through words that aren’t backed by action. A customer can easily feel if the employee they are working with hates their job because it will naturally come out in the employee’s attitude. Humility and accountability are also vitally important. It takes humility to really listen to customers and be willing to do what they are asking and listen to their feedback. Framing is also key to a strong culture. Employees need to see how their work affects customers and the difference they can make. At Capital One, employees know they aren’t just answering the phones at a credit card company, they are helping people with their financial lives. Everything rests on building that sense of purpose, from training and accountability to the quality of the experiences. Identifying the metrics that will measure customer-facing actions can also drive culture and action. It might be tracking NPS or other metrics, but having something to measure makes people accountable and forces them to follow through so the actions are rooted in the culture. Much of what builds a customer-centered culture starts with the mindset of the leaders and employees. As demonstrated by Capital One, having an attitude of serving customers can permeate the entire organization and lead to great success.